A SPRING LEEK GRATIN | Jane Lear. Writing on Food and Travel. In May, there are days when the sun beats down like summertime. And then there are days when the temperature hovers in the 50s, and mist turns into a drizzle so gradually you don’t even notice. Until you are soaked to the skin, that is, and chilled to the bone. I am not complaining for a second, mind you—we need every raindrop that falls—but it complicates matters as far as supper is concerned. That’s when everyone needs something warming and sustaining, yet not remotely wintry. Thank goodness for leeks. They are available pretty much all the time, but in the spring they, like other alliums, are especially juicy and turn lush when cooked. You can get a good idea about how I like to use them (and then some) from this post from 2013. But this year I’m happily stuck on leek gratins. This is entirely Georgeanne Brennan’s fault. I first learned how simple and versatile gratins were at her cooking school in Haute Provence years ago, and for a long while they were part of my culinary repertoire. Then they fell out of my rotation for some reason; I don’t remember why. I was reminded of their ease and utility, though, when I wrote up a q&a with Georgeanne for The Wall Street Journal back in February. Her leek gratin makes a delicious side to roast chicken, pork chops, or what have you. It also holds its own as a main course; just add a crisp romaine salad and a loaf of good bread. If you want to make it a bit more substantial, scatter shards of cooked ham over the leeks before adding the cheese. Any leftovers are good chopped and worked into an omelet. One last note: Using a combination of Gruyère and Parmiagiano-Reggiano may seem fussy, but the addition of a little Parm always bumps up the flavor of another cheese. It’s for sass, as my great pal Damon Lee Fowler says. 1. Preheat oven to 400 degrees. Trim leeks to fit crosswise in a large gratin dish, leaving some of the green on half of leeks. 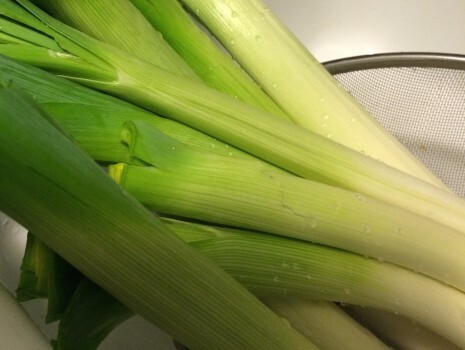 Run cold water into top of each leek, opening layers gently. Use cooking twine to tie leeks in bundles of 3-4. Bring a large pot of water to a boil. Add 1 teaspoon salt, then carefully add leeks to pot. Cook over medium heat until slightly limp but greens are still bright, 8-10 minutes. Drain and set aside. 2. Melt 2 tablespoons butter until foaming in a medium saucepan over medium-high heat. Remove from heat and whisk in flour. Gradually whisk in 1¼ cup milk. Stir in pepper and remaining salt, then place over medium-low heat. Cook sauce, whisking occasionally to prevent lumps, until thickened to the consistency of yogurt, about 15 minutes. If sauce is too thick, whisk in additional milk, 1 tablespoon at a time, to achieve desired consistency. 3. Butter gratin dish, then spoon in about ¼ cup sauce. Place leeks over sauce in a single layer, alternating green and white ends. Spoon about ¾ cup sauce over leeks, but do not fully cover. 4. Sprinkle cheeses over leeks and bake until sauce begins to bubble and surface begins to turn golden brown, about 15 minutes. For more color, briefly place under broiler. Serve hot or warm.